The Cycle Haus offers the best in bike rentals in the Harrison ID area. Located next to a world-renowned bike trail, The Cycle Haus Bikes & Brews offers bicycle rentals, service, and sales, along with delicious Doma coffee, and craft beer. With excellent products and experience, this is a place where people can come and enjoy good vibes, whether their a cyclist or not. The great ambience offers indoor seating with a one of a kind bar and a court yard that allows everyone to kick back and unwind while enjoying the feel of the local culture. 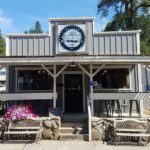 If you are in the Harrison Idaho area and need to rent a bicycle while there, The Cycle Haus is your place for biking Trail of the Coeur d’Alenes and the area around Harrison ID. 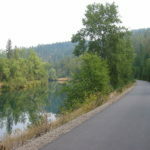 The trail’s 73-mile (117 km) route winds through the mountainous terrain of the historic Silver Valley into the chain lakes region, along the shore of Lake Coeur d’Alene over the Chatcolat Bridge to Heyburn State Park and finally climbs to the Palouse Prairie. Trail users can continue along a bike path in Washington that will eventually lead to Spokane. Get your bike rentals Harrison ID here at the Cycle Haus.